The sun had set when I saw someone walking up the canyon along the remains of the old road to Panamint. It wasn't dark enough for artificial light, but it was getting close. I was on the front porch, cooking dinner. I was not expecting visitors—not up there, no, not in that corner of the world. And what a visitor he was. He was red-faced, exerted, and his gaze was focused far beyond, past the old town site and up toward the ridge that marked the end of this canyon and the beginning of the next. It is a difficult hike—a filter for the uncommitted. He carried two backpacks, a large one on his back, and a smaller one on his front. 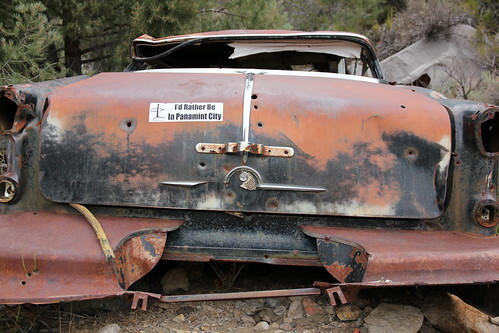 He seemed strange—a viable candidate for the mayor of Panamint City, California. 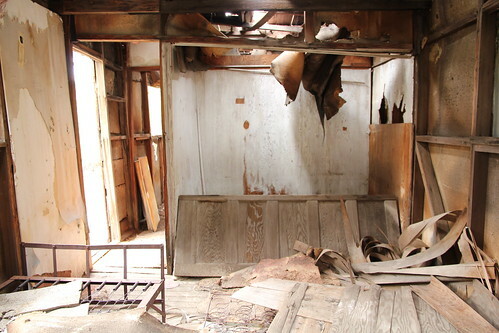 Panamint is a derelict place, a ghost town. Of course it should attract derelict people. I was there. I was derelict, too. Ken was going on a bit of a walk, a magical misery tour of Death Valley. Around Death Valley. No exaggeration. He was circumnavigating Death Valley by way of the surrounding mountain ranges . Six hundred miles, give or take. Just caching food and supplies would take him to corners of the park that are so rarely visited they may as well not be on the map. He was going through hell, and taking the difficult route to get there. Alone. What a nut. What a madman. I liked him immediately. There are still some among us who haven't fallen in line yet. Good for him. I understood his geography. That was his first day, his first ten miles—about five thousand vertical feet and ten trail miles from Ballarat. Five hundred and ninety miles to go, give or take. In the morning he lay in bed in the back room of the cabin, staring at the ceiling. Stay? Go? 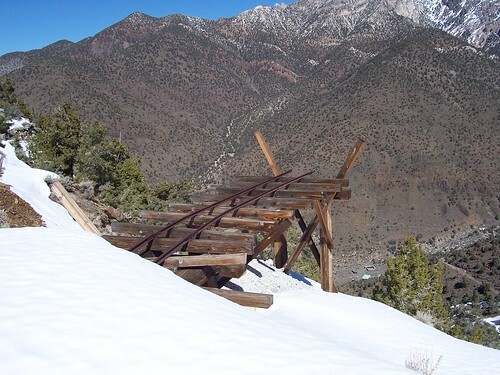 Up over Telescope Peak to Mahogany Flat? He went. I don't know if he made it. I first hiked Surprise Canyon six years ago. How much water has gone under the sand since then. Panamint was my base camp for hiking to Sentinel Peak, a summit to the south of the city. I didn't make it that far. The desert below was dry, but the mountains were still covered in snow. Surprise. This may seem obvious but I grew up in Illinois, where mountains are mythology and climate varying with elevation is an abstract idea. Snow. I followed the old mine road to upper Wyoming Mine, where I quit, red-faced, exerted, hands on knees after an hour or two of postholing through the snow, Sentinel Peak nowhere in sight. I returned with more preparation and less snow. In the morning, I hiked the old mining road up and up to Wyoming Mine, perched a thousand feet above the town site. 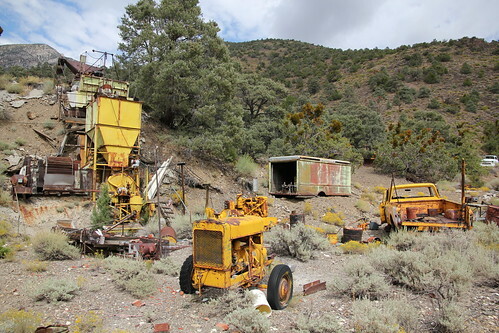 Wyoming Mine is a fantastic installation in the museum of Panamint, with derelict generators and pumps and carts and tramways arranged as they were abandoned. There is no trail to Sentinel. The road peters out at Wyoming Mine—or it doesn't. I clambered up the edge of the graded road beside the mine. Paused. 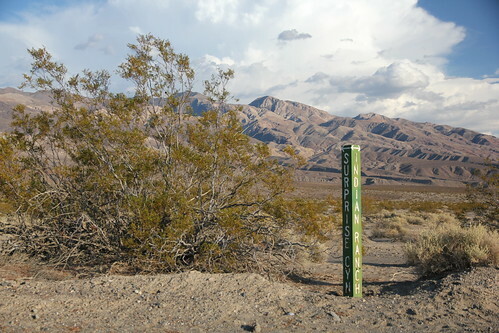 Walked forward to the corner of the ridge that pointed toward Panamint Valley and the Argus Range beyond. Calm. No reason to go anywhere. Not up. Certainly not down. In that moment the rest of the world was forgotten, gone, had never existed. I was the first and only. I wasn't the first. There were bits of broken green glass underfoot, piles of rusty cans to the right, and artificially stacked piles of rocks to the left. 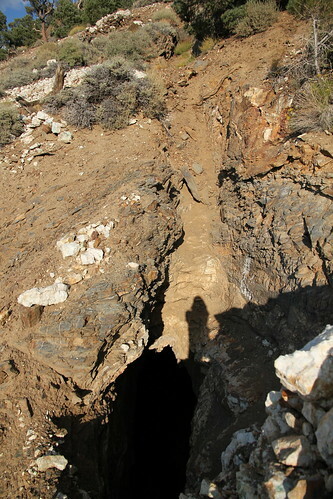 A path emerged from the gravel hill side, leading around the corner and into Marvel Canyon. Sentinel was the high point. I could go there at any time just by walking up until there was no more up. This path was immediate, insistent. I won't vouch for an exciting time around the corner. The trail became a little broader, more defined. There were more cans, more bottles, more low rock walls, more mine adits, more mine tailings. All of these unremarkable things were remarkable because they were unexpected. There was always one more piece of evidence to be found, one more prop for the imagination. The real show wasn't on the mountain, but in my head. What was it like to be here when the action was happening? What was it like to work this far from the established world? What was it like to hope for a big strike? What was it like when the bubble burst and the speculation ended? What was it like? The men left the mines years and years ago, but the burros stayed. At night, far away—but never far enough—in the canyon they bray like bellicose ghosts. HAW, EEHAW, EEHAW. In the distance the sound is chilling. When they wander into the foreground the sound explodes like a mortar. I do not like the burros. I hiked up Sourdough Canyon on another morning, on another old mining road. The sides of the path were littered with the stratified debris of temporary human settlement. 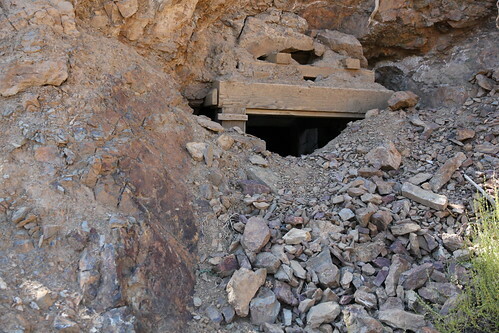 In the lower layers were the mining equipment and occasionally habited structures. In the upper layers, higher up the road, there was little more than rusty cans, weathered boards, maybe a few bedsprings. In between there were cots, stoves, disintegrating clothes, standing walls, and the ghosts you never believed in. I walked, eyes on the ridge line that connected to the spine of the Panamints—morning meditation in the mountains. A snort/cough erupted from the hill to the left. I yelled. I danced on one foot. These are evolutionary responses that I do not claim as my own. It was another burro. Of course. Territorial bastards. Standing rigidly, twenty or thirty yards away. Staring with solid black eyes. Can burros think? Do burros dream of feral sheep? I tossed rocks into the ditch between us, just to let him know that I meant Business. I picked up a few more rocks and kept walking, up and up. Behind me, around a bend in the trees, I heard the clattering of rocks. Burro. I heaved the rocks in the direction of the sound. The sound resigned. Up and up. The road banked out of Sourdough Canyon and climbed the ridge to the west. It was now a true road—graded by powerful tools but not degraded by time and weather like other relic roads. My mission: a square at the top of the road. I had seen the square, a neat little square, in satellite pictures. It was an absurd geometry in an otherwise random landscape. What was the square? Why was it there? 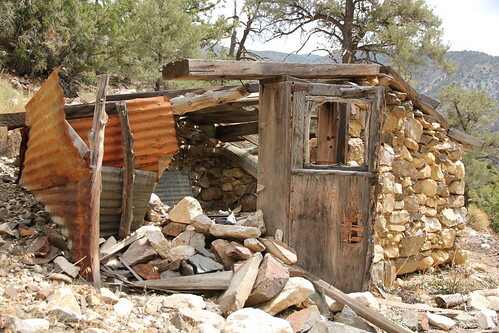 Was it a cabin on the saddle between Surprise Canyon and Hall Canyon? Should I expect a shotgun salute upon approach? A buckshot bienvenue? Fine, fine—a fine way to go out, better than being bitten by a burro or stepping into a mine shaft. Up and up. The cabin was nothing—and everything. The door remained. The windows did not. There was a barrel converted into a stove. There was a cot. Insulation had fallen from the walls. Graffiti took its place. There were empty shotgun shells and broken bottles—mementos of 4x4 trips past. It takes a certain type of person—and not a very interesting one, I suppose—to be excited by all of this. So be it. 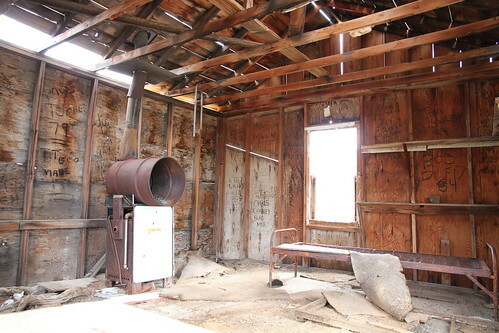 Before leaving Panamint, I borrowed a handsaw from the main cabin and collected a bag of empty propane bottles, beer bottles, and liquor bottles. The trash man comes infrequently to Panamint. The day was clear, blue, warm. I followed the old road, downward ever so much faster than the grinding walk up. The handsaw I employed to clear the tunnel through the vegetation in the canyon. In the willow and tamarisk jungle, up and down were equally difficult, frustrating. Ten years since the last vehicle passed that way, and the trees and grapevines are getting thick. So be it. I left the handsaw on the trail register with a note: saw your way back up. At Novak Camp I put the rental car in gear and rolled slowly, slowly, slowly down the road, not willing to risk an oil pan or tire or gold-plated tow out of the valley. At the bottom, at the junction of Indian Ranch Road and Surprise Canyon Road, on the edge of the dry lake, I stopped, stepped out barefoot in the gravel. I turned to see where I had come from. Other humans, whether Timbisha thousands of years ago or single blanket jackass prospectors a hundred and fifty years ago, looked at those awful mountains and said to themselves, "Let's go there." And some people insist that we are the intelligent species. Madness. I blazed down the gravel road, and then down the paved road, and then up the intermittently paved and unpaved road to Wildrose. Balls to the oil pan. I could, with the right amount of foot pressure, make it to Aguereberry Point before sunset and see Death Valley at its sultry, beautiful best. Rattlesnake Gulch, White Sage Wash, A Canyon, Wood Canyon—zoom down the asphalt. Lean into the turns. Down the barrel of Emigrant Pass. Harrisburg, Eureka Mine—six miles and a cloud of dust, no need for any real traction on the corners. I barged around the final turn to Aguereberry Point, spitting rocks. The sun was a memory of pink clouds in the west. There were no people anywhere—maybe they had never existed, maybe they were just another mirage in this desiccated, brutal, awful place, just a few more ghosts in there or out there or wherever. All of my photos from Panamint City on Flickr: Panamint City, September 2011; Panamint City, March 2005. Recommended reading: Richard Lingenfelter, Death Valley and the Amargosa: A Land of Illusion. This entry was posted in Travel and tagged California, Panamint on 2011-12-04 by kirk.kittell. Great job! I plan to go back to Panamint city in few weeks and your notes were just awesome.